Accidents can happen anywhere, no matter how careful you are. 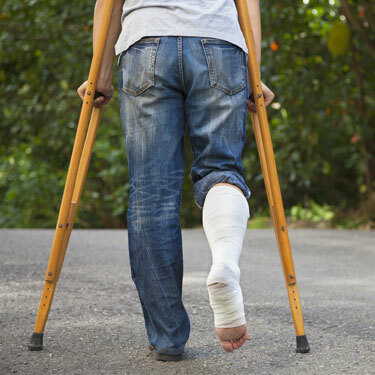 Slips, falls, and car crashes can’t always be prevented, leaving you injured with no way to pay your hospital bills. At The Jordan Insurance Agency, we care about both your physical and financial well-being, which is why we’ll always help you find the right fit for your needs. Rather than facing the challenges that come with injury alone, we can offer you a customized approach to insurance coverage. Whether you throw out your back while shoveling snow or break something while enjoying a jog, accidents can happen to everyone. Instead of paying the price out of pocket, a supplemental policy can provide the benefits you need. Accident insurance is available to everyone without a medical exam, providing an extra element of coverage. If you work a physical job, are involved in athletics, or enjoy potentially hazardous leisure activities, like rock climbing or hiking, an accident policy can keep you covered should an event not go as planned. With benefits for dismemberment and death automatically included, you can go through life knowing you’re always protected. When your health insurance won’t deliver, supplemental accident insurance can. Deductibles are generally very low, averaging around $250, with coverage amounts up to $15,000. Whether you have unforeseen medical expenses, time out of work due to your accident, or are disabled as a result, your supplemental coverage will carry you through. With the ability to cover expenses like your health insurance deductible, co-payments, and amounts that exceed traditional coverage amounts, your insurance policy will always have your back. When you’re looking for the best way to protect yourself and your family, The Jordan Insurance Agency can work with you to determine the right coverage for your situation. With the ability to custom-tailor plans based on your career, your hobbies, and your lifestyle, our agents can always ensure you’re in good hands. We work with some of the country’s premier insurance companies, providing reliable protection, in both good times and bad. Fill out our quick online quote form for a free supplemental accident policy quote, and see just how affordable out help can be!